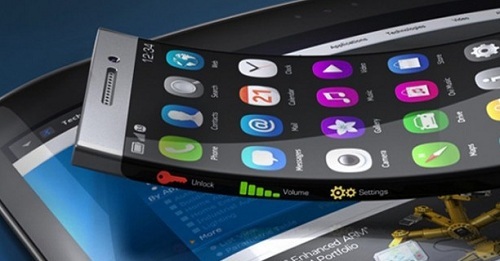 A new era in Mobile Technology has begun with the development of Flexible Mobile Display. Many famous mobile manufactures have geared up to launch their new display phones. Samsung has reviled its first Flexible AMOLED display mobile at CES 2014. LG has also developed flexible display mobile named G-Flex. It has a curved OLED display. Mobile technology saw a huge leap with the development of Touchscreen technology. It opened new door for applications. Now mobiles are more user interactive with bigger displays. But a need was always felt of flexible display because of the ever increasing screen size and breaking of display. Manufactures tried to consolidate for the later by implementing IPS and Gorilla Glass display. This display can be folded in different shaped or rolled like a paper. The technology is still in its early days of development. The flexibility of display is still limited by the fact that electrical connectivity reduces with folding of display. But sooner full flexible displays will be available. In the not so distant future you will see mobiles in whole new shapes. Samsung Youm, comes with 5.3 inch flexible AOLED display. It has full HD support for video recording. A 1.9 GHz quad-core processor for fast processing with 1 GB RAM for applications. It will be available in 16GB and 32GB storage option. At the back it houses a 13 megapixel full hd camera which is capable of recording videos at 1080p. The mobile also has 2 megapixel front facing camera for video calling and “selfy”. The mobile runs on Android 4.2.2 Jelly Bean which is upgradable. For long lasting power Youm packs 2850 mAh battery. LG G-FlexG-Flex comes with 6 inch OLED display. It is not completely flexible but it can be curved more than other phones. A 2.26 quad-core processor for fast operation that gives users a rich experience. 2GB RAM for running applications and 32 Gb memory for storage. It has 13 megapixel primary camera to take care of users need and a 2.1 megapixel secondary camera. It runs on Android 4.2.2 Jelly Beam. A long lasting battery of 3500 mAh for hours of net surfing, calling and gaming. Other prominent mobile manufactures are also developing their flexible display technology. Sony and Nokia have developed their prototype model and soon will be launching mobile with flexible display. A new era in mobile technology has begun.